Hey guys thought I would tell you about my trip to Orlando Florida - with The Children's Miracle Network ( CMN ). I was the only Australian representative, and I received a medal for my strength and courage in dealing with my illness. It was so so brilliant we stayed at Disney World, met some really lovely people, everyone was so nice to us. 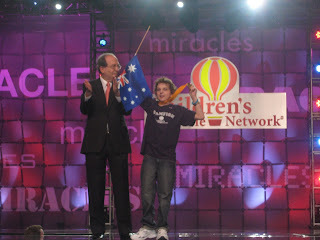 We were there for the CMN Celebration, where all the sponsors, hospitals and the chosen champion children got together. There was 1 child from every state of America & Canada, 3 children from the UK and 3 from Ireland and then little old me from Australia. I was away from Australia for 3 weeks because I had to have stop overs in Honolulu and LA for 2 nights each so we could regulate my medical procedures. I know what your thinking ' poor me ' it must have been awful......... we didn't get to see any of LA as we were in an airport hotel. In Honolulu though we were right on the beach so we got to see Waikiki - which was awesome - the surf boards are HUGE !!!!. I have attached some photo's of my stay.